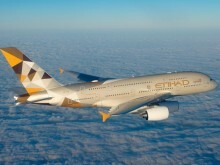 Etihad Airways’ 486-seat A380 will provide customers on the route with new in-flight experiences such as The Residence, a luxurious three-room cabin which can accommodate two guests in complete privacy and nine private First Apartments. The double-decker aircraft also boasts 70 Business Studios and 405 Economy Smart Seats. This includes 80 Economy Space seats with a seat pitch of up to 36 inches.